"You hit the ground when I was about to go berserk. Lucky!" Alex is a powerhouse wrestler who lives in Manhatten with his father's old friend Tom, Tom's four year-old daughter Patricia, and his own daughter, Pauline. Tom took Alex in after Alex's father died and raised him like a son. He even trained Alex in his gym, and Alex quickly became a powerful yet agile fighter. 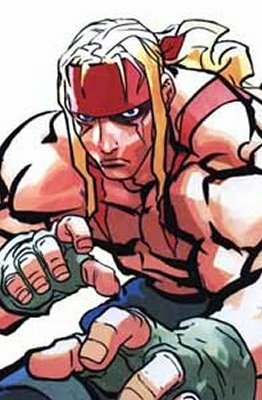 Alex eventually signed up for military duty, and earned a reputation as a great Street Fighter. When he returned from service, Alex discovered that Tom had been defeated and gravely injured by a mysterious man named Gill. Gill had apparently visited Tom to recruit him into Gill's personal army. Tom refused, and Gill brutalized him as a message to Alex: if Alex didn't join with Gill, something worse might happen to Tom, or even Patricia or Pauline. An angered Alex swore vengeance and entered the third World Warriors tournament in order to fight Gill. Having trained hard in anticipation for the conflict, Alex was among the most powerful warriors in the tournament. Despite his great skill, Alex was captured by Gill's forces and was about to become one of Gill's super soldiers before he was freed by the undercover Chun- Li. After his escape, Alex confronted Necro and emerged victorious. Upon his return home, Alex found Tom and Pauline were awaiting his return. Alex, discovering that there were many other strong fighters in the world, decided to venture out into the world and prove his worth in competition.